So it's Friday at 5:00 pm. You're finally able to leave the office, and you run out the door, hop in the car and race home. Once there, you stop just long enough to change into more comfortable clothes, snag your packed bag and make sure the fish have food. You pick up your camping buddies and hit the road — only to end up stuck in hours of rush hour traffic. Your happily anticipated road trip out of the city and into the scenic countryside now has become fields of taillights rather than rows of crops. By the time the traffic begins to break up, the sun is dipping below the horizon — and you still have a ways to go. You and your companions continue on until the brown metal road signs announce the proximity of your destination. You pull off the main road onto a quieter one, one whose only lights are the reflective, unblinking eyes of deer. The gate is ahead, and you roll to a stop at the gate house — only to realize that there is a metal barricade blocking the road and no one in the office to let you in. You've finally arrived, but you can't make your way into the park because you arrived after hours! What to do? Photo by Alan Stark, used under the Creative Commons. Click for link to original work. Photo not modified from its original form. This ardent camper has been there before. Here are some tips for avoiding this situation. It's always a good idea to call the office the day before you head out on your trip, especially if you have reserved a campsite at a public park or forest. While you're checking on the status of burn bans and wildlife activity, ask what to do if you should arrive after the office closes. Sometimes they'll let you know this is no problem at all, and that you should simply come to the office in the morning after you wake up to check in. Other times, they'll let you know that there will be a locked gate to greet you, but a combination to unlock the gate will be provided over the phone. Even if you have gone through this process, bring an offline copy of the office phone number with you. If you have further questions or trouble getting into the park, you might not have cellular or data service, so you may need to go in search of a payphone. If you've never used it before, set your tent up at home so you know how it works. Setting up an unfamiliar tent in the dark is no fun at all. When you're packing your bag, make sure everything you'll need immediately is readily available. This includes your lantern or headlamp, tent, tarp or footprint, sleeping bag and pillow, sleeping mat, sleeping clothes, toiletries and cooking supplies if you're making dinner when you arrive. This is especially important if you are hiking in to a primitive site; go ahead and completely pack your backpack before you leave, and put the headlamp right on top for quick access. Print a copy of the park map before you head out. That way you can navigate the park to find the campsite area without the help of the rangers, whether you're driving or walking to your new home for the evening. Even if the office is closed, stop by the building anyway. Some parks require overnight guests to pay through an envelope or box system and then affix the receipt to their windshield. You don't want to wake up to a ranger seeking payment in the morning, so take care of it ahead of time, if possible. When you reach the camping area, be considerate and keep your music low, voices down and your car's brights off. Many of your fellow campers will already be asleep. Most parks post quiet hours, so be sure to abide by these; they often start at 10:00 pm. If you are in a car camping area, drive through to pick out your site. Chances are the others will have selected the best sites unless you were able to reserve a particular one ahead of time. Personally, I'm looking for a tent pad that is set back from the road with some trees providing privacy from both the road and other campsites. It is often very difficult to tell in the dark if the available sites will meet your needs, so don't be afraid to hop out of the car and explore with your headlamp or lantern. Once you select your site, get out your tarp and tent. Clear the tent area of all rocks and large sticks, then lay out the tarp. Set up your tent just as you practiced at home, and position it so it is as flat as possible. If there is a slight angle, put your feet at the bottom and head at the top. When the tent's doors are open, try to keep your lantern off its white light setting so you don't attract bugs inside. Wait until you have all doors zipped shut before turning on a white light. To preserve your night vision and keep bugs out of your face, use your lantern's red light setting if it has one. Place your food and other smelly items in a bag and suspend it from a tree to keep the animals out. Set an alarm if you need to get to the office by a certain time in the morning to check in. Get out there and stargaze! Go on a night hike! There's lots to do in the evening, so enjoy yourself. Just stay safe! With some simple planning, arriving at a campsite at nighttime is no problem at all — and it can actually be lots of fun! Sometimes you can feel like you have the whole place to yourself, no matter how busy the park might be. Keep calm, take your time and savor the first evening of your campcation! 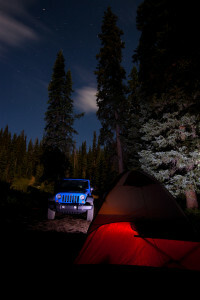 Do you have other tips for handling arriving at a campground at night? Let me know in the comments.